Other messages on the board: "The Brothers who speak will shake the dirty, infidel pork-eaters, make the Parliament (lit: Big Thing) into a little thing" and, in English: "Americans, including civilians, should be killed by muslims anywhere in the world." The Norwegian Parliament has given permission to a group of Muslim extremists to demonstrate against the Afghan war on Jan 20th, after Friday prayers. The group thinks all Norwegians are guilty of 'massacring innocents' in Afghanistan. 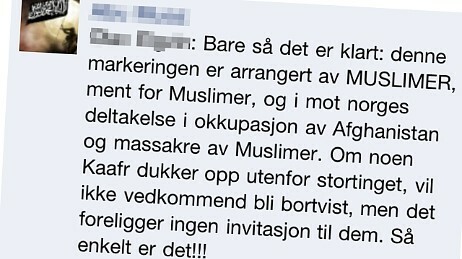 The Facebook group where the event is being organized praises terrorists and cheers when NATO soldiers are killed. Some of the group members expressed concern that the demonstration is 'un-Islamic' and imitates the Kuffar. The group's profile assures that the demonstration will be peaceful and that men and women will be separated. It's unclear who's behind the group. NRK had learned that the organizers are a network of 5-15 people who are active on social media. The group has 1238 members, but some members contacted by NRK said they did not realize what type of group this was.